Ectopic eruption originates from the malpositioning of a tooth bud ending in the eruption of the tooth in an improper direction. 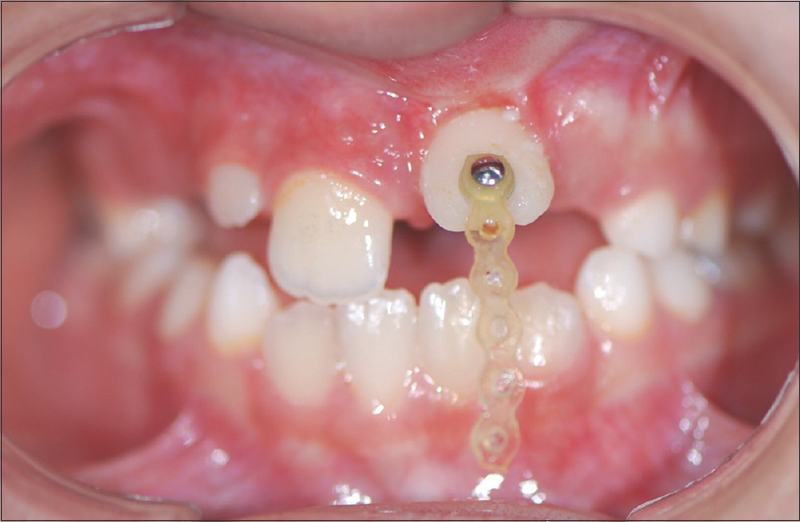 This anomaly is a consequence of ectopic development of the tooth germ. 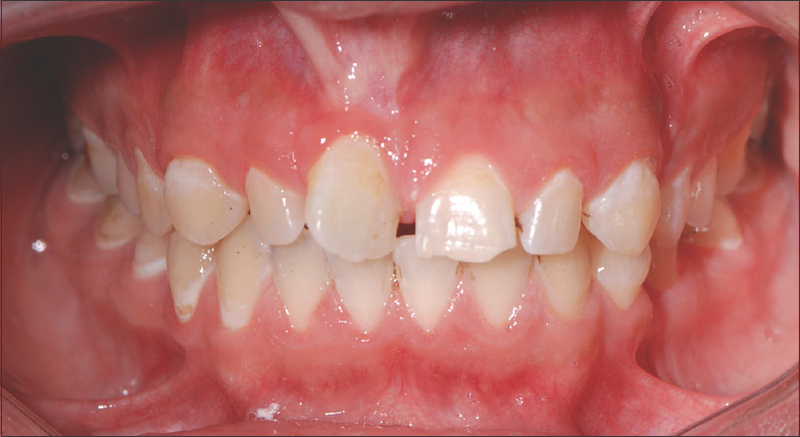 This condition gives rise to significant aesthetic and occlusal issues in the early mixed dentition stage. The most frequently influenced teeth are the maxillary first molars, accompanied by the maxillary cuspids. Ectopic eruption is seldom seen and might derive from traumatic injury. In some cases, hyperplastic and fibrotic gingival tissue may lead to ectopic eruption of a permanent incisor. Managing ectopically erupting teeth generally rests on several reasons including extraction of supernumerary tooth, removal of cyst and excision of hyperplastic tissue and subsequent to orthodontic movement of tooth if necessary. In this case, the use of Er, Cr: YSGG lasers for the correction of hyperplastic soft tissues involving ectopically erupting permanent incisors are depicted considering two cases. Ectopic eruption is the malpositioning of a permanent tooth bud resulting in the eruption of the tooth in improper direction. 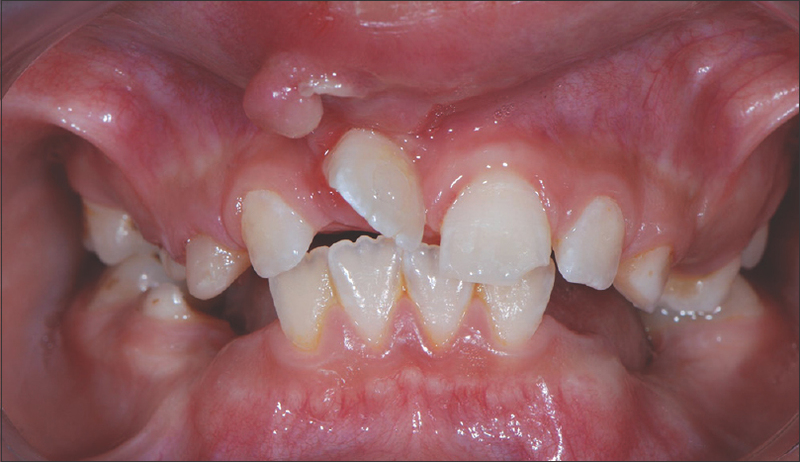 The condition precipitated the physical displacement of the permanent teeth, the lack of eruption guidance and crowded dentition, while infection, cyst, supernumerary tooth and crowded dentition may also cause this condition., In some cases, there are no signs of these factors and it is suggested that this anomaly is a result of ectopic development of the tooth germ. This condition causes important aesthetic and occlusal problems during the early mixed dentition stage., The most commonly affected teeth are the maxillary first molars, followed by the maxillary cuspids. Ectopic eruption of a permanent incisor is rare and may result from traumatic injury to its predecessor. Occasionally, hyperplastic and fibrotic gingival tissue can also cause ectopic eruption of a permanent incisor. In this case series, we describe the use of lasers for the correction of hyperplastic soft tissues around ectopically erupting permanent incisors in two cases. 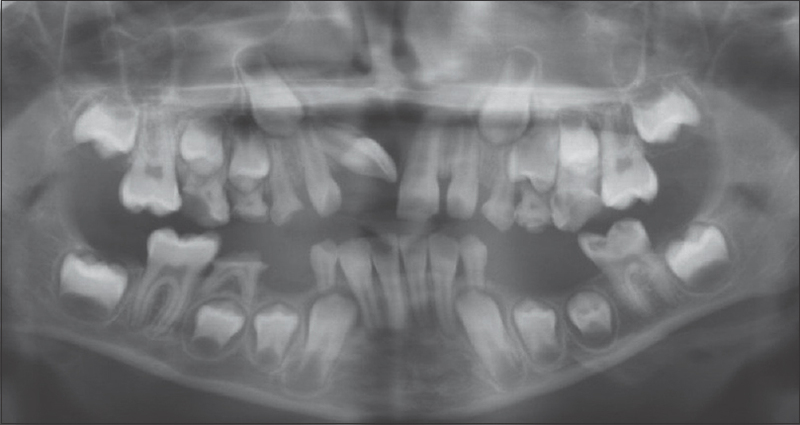 A 10-year-old boy with the main complaints of missing teeth and swelling on the maxilla was admitted to the Pediatric Dentistry Department, Cukurova University, Turkey. The parents reported that he had physical traumatic injury on the maxilla at 4 years of age. The intraoral examination revealed that the maxillary right central incisor was not within the dental arch. Instead, the tooth had an ectopic location in horizontal position at the level of the labial sulcus under the mucosa of the upper lip. The mesial edge of central incisor could be observed when the patient's upper lip was stretched up and outwards thoroughly [Figure 1] and [Figure 2]. The location and the position of the crown had caused hyperplasia of the gingival and mucosa rotating partially in the redundant mucosal tissue and forcing the incisor to erupt toward the inner labial mucosa. The radiological examination showed that the apex of the maxillary right central incisor tipped distally and the crown had rotated probably due to fibrotic redundant gingival tissue. The reason for not erupting the maxillary right central incisor is that there is gingival tissue. There was enough space for eruption [Figure 3]. The treatment plan consisted of the excision of the fibrotic gingival/mucosal tissue and orthodontic movement of the tooth within the dental arch. The hyperplastic tissue around the tooth was excised with Er, Cr:YSGG laser (2.75 W power, frequency 20 Hz, air:water 60:40 for 10 s). The excision lasted until the soft tissue was detached to expose the crown from the maxillary right central. There was minimal bleeding during the laser procedure and the early post-operative healing period was eventless. After 2 weeks, the tooth erupted slightly due to the removal the restraining hyperplastic gingival tissue [Figure 4]. Orthodontic extrusion was initiated using a modified Hawley appliance with palatal hook applying light orthodontic forces. Then, an orthodontic button was bonded to the buccal surface of the tooth [Figure 5] and extrusive movement of maxillary right central incisor was started by securing elastics between the button and the palatal hook of the appliance. 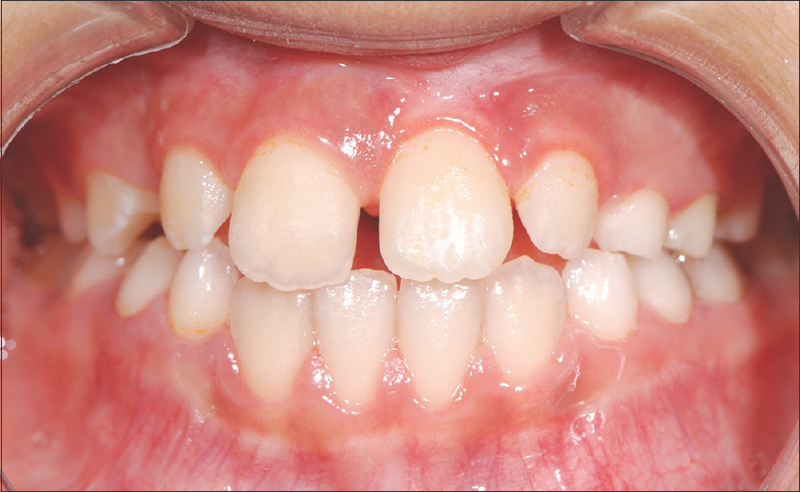 Four months later, the labial gingival mucosa healed dramatically as the irritating incisal edge was moved gradually in the occlusal direction. Healing of labial mucosa, the tooth and supporting tissue appeared to be clinically and radiologically in good condition [Figure 6] and [Figure 7]. A systemically healthy 9-year-old girl was referred to the Pediatric Dentistry Department in Cukurova University, Adana, Turkey. 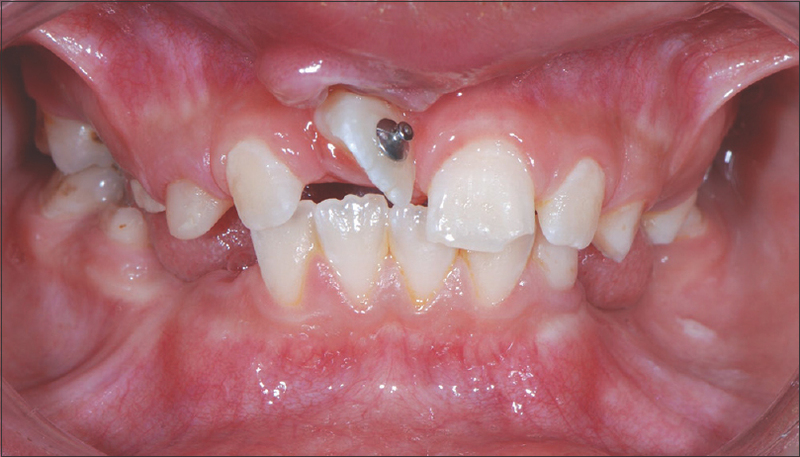 The main complaint was the absence of maxillary left central incisor and the child had a history of trauma to the jaws 4 years ago. 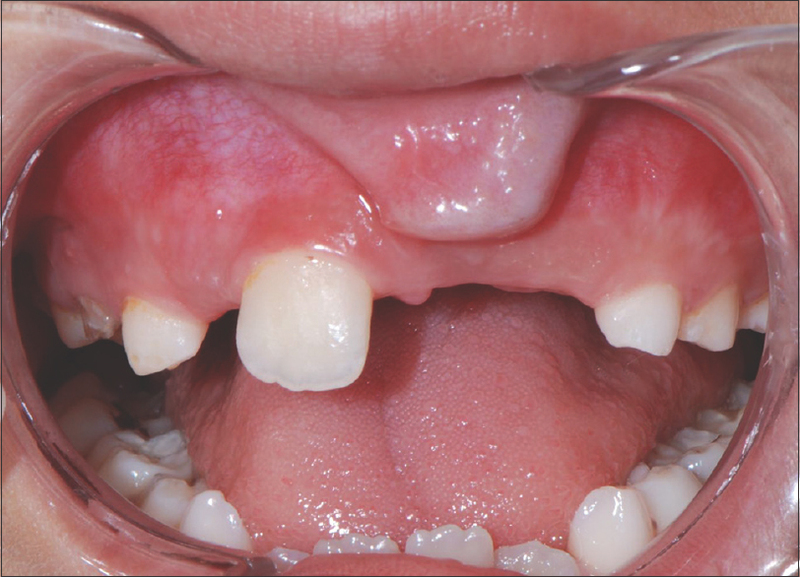 Her parents reported that maxillary left central incisor did not erupt after exfoliation of the primary precessor. Intraoral examination revealed that the maxillary left central incisor was not visible clinically but stayed unerupted and completely enclosed within the maxillary labial gingival tissue [Figure 8]. 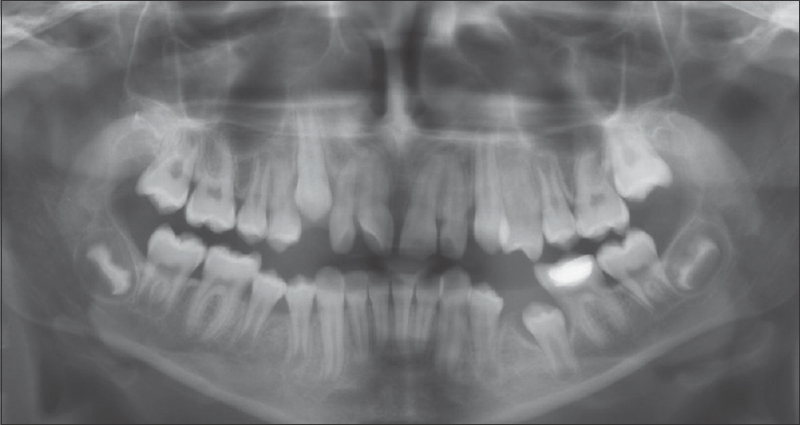 Radiological examination showed that the tooth was displaced into a horizontal position and the incisal edge of the crown was horizontal at occlusal level [Figure 9]. Treatment plan consisted of two stages: surgical excision of labial gingival tissue by laser and orthodontic extrusion of the tooth by modifying the Hawley appliance with palatal hook. Firstly, laser excision was done using Er, Cr:YSGG laser with 2.75 W power, frequency 20 Hz, air:water 60:40 for 10 s each time till the fibrous tissue was completely detached from the maxillary right central [Figure 10]. The crown of the tooth was exposed and it could be visible in normal mouth-opening positions [Figure 11]. Two weeks later, slight eruption of left central incisor could be observed towards the occlusal direction with healing of labial mucosa and soft tissues around the crown. Then, the orthodontic extrusion was initiated using a modified Hawley appliance. An orthodontic button was bonded to the buccal surface of the tooth and extrusive movement of the tooth was initiated by securing a plastic chain (pc). The patient and her family were informed about how to change the ligatures and weekly control visits were scheduled [Figure 12] and [Figure 13]. 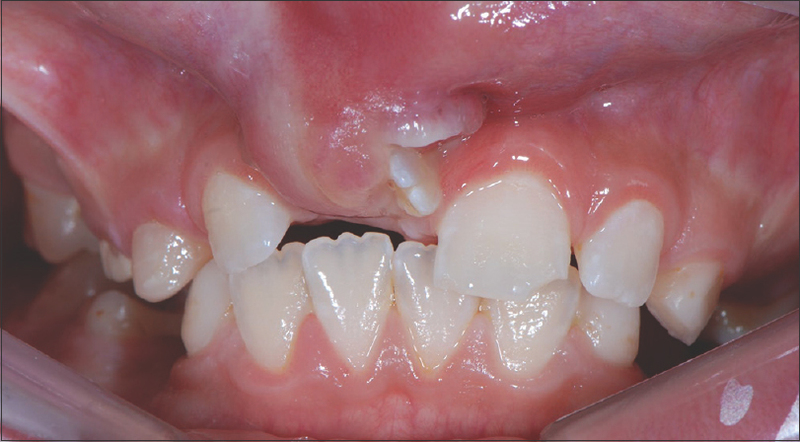 After 3 months, dilacerated maxillary left central incisor was properly erupted in the dental arch and labial mucosa and gingiva were completely healed [Figure 14]. The position of the tooth was also radiologically confirmed [Figure 15]. For unerupted horizontally positioned tooth, the orthodontic extrusion should be immediately performed when the unerupted tooth is exposed in the oral cavity., Canoglu et al. have used a modified fan-type removable expansion appliance for orthodontic extrusion of unerupted central incisor in a 9-year-old, while Gugnani et al. 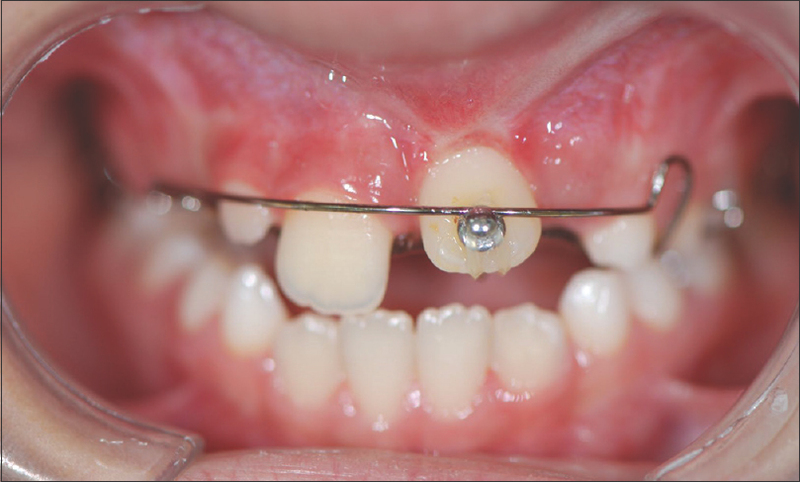 have placed fixed orthodontics braces with coil spring for orthodontic alignment. In this case series, removable appliances were used on account of the sufficient space for eruption of ectopic erupted central incisors. In both cases, the teeth moved relatively fast getting into the dental arch and proper position within 3–4 months. Surgical exposure and moving the tooth into normal occlusion with light force orthodontic procedure is well documented as the current treatment modality.,, However, in most cases, surgical procedures such as apically positioned flaps, U-shaped flaps , or gingivectomy excisions by scalpels, electrocautery or cryosurgery ,,, are also needed to remove the fibrotic gingiva or mucosa around the tooth to expose it to the oral cavity. These surgical procedures are also needed to place braces or buttons to move the tooth to proper position. In this case series, laser excision was used to eliminate hyperplastic labial mucosa barrier for eruption of maxillary central incisors into occlusal direction. Kumar et al., concluded that Er, Cr: YSGG lasers (a type of combined soft and hard tissue laser) can be used as an alternative method to conventional scalpel method with the superiority of causing no discomfort and no complications with good wound healing in children. The use of this laser in children is particularly beneficial in surgical procedures of oral operation, the length of intervention and the proportion of local analgesia are decreased by the use of the laser. Therefore, this technique can be said to be practical and easy since it contributes a haemostatic effect that develops visibility of the operated area, which provides a significant advantage in children's small mouths. Owing to the haemostatic effect, it is easier to place braces in the unbleeding area in the same session. Recent studies have shown accelerated wound healing and reduced healing time by using laser therapy, resulting in less post-operative pain, oedema, discomfort and reduced need by using analgesics., Micro-gingival surgery with laser can be done for treatment of traumatic injuries to unerupted teeth. Possible treatment options are that gingiva on which a button can be bonded can be lifted upwards by using scalpel, and that children can receive fixed orthodontic treatment in later stages and ages. Laser-assisted surgical procedure has sufficient incision performance and advantage over conventional surgery in that there is a sealing of small blood and resulting in haemostasis, reduced post-operative oedema and pain. The Er, Cr: YSGG laser can be regarded as an alternative method when compared to the conventional scalpel method because this laser technique heals teeth wound better by alleviating discomfort and complications significantly, which refers to the superiority of the technique. Stewart D. Dilacerate unerupted maxillary central incisors. Br Dent J 1978;145:229-33. Andreasen JO, Petersen JK, Laskin DM. Textbook and color atlas of tooth impactions. Copenhagen, Denmark: Munksgaard; 1997. p. 199-208. Tanaka E, Watanabe M, Nagaoka K, Yamaguchi K, Tanne K. Orthodontic traction of an impacted maxillary central incisor. J Clin Orthod 2001;35:375-8. Crawford LB. Impacted maxillary central incisor in mixed dentition treatment. Am J Orthod Dentofacial Orthop1997;112:1-7. Brin I, Ben-Bassat Y, Zilberman Y, Fuks A. Effect of trauma to the primary incisors on the alignment of their permanent successors in Israelis. Community Dent Oral Epidemiol 1988;16:104-8. Lin Y-TJ. 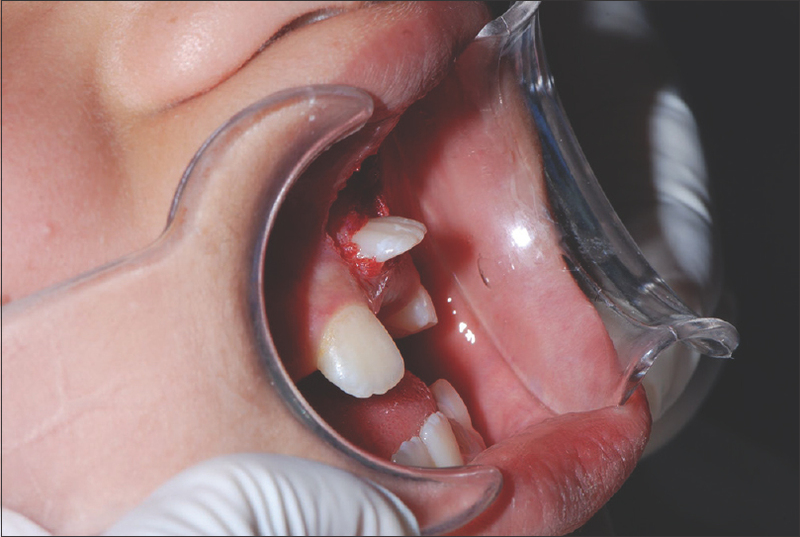 Treatment of an impacted dilacerated maxillary central incisor. Am J Orthod Dentofacial Orthop1999;115:406-9. 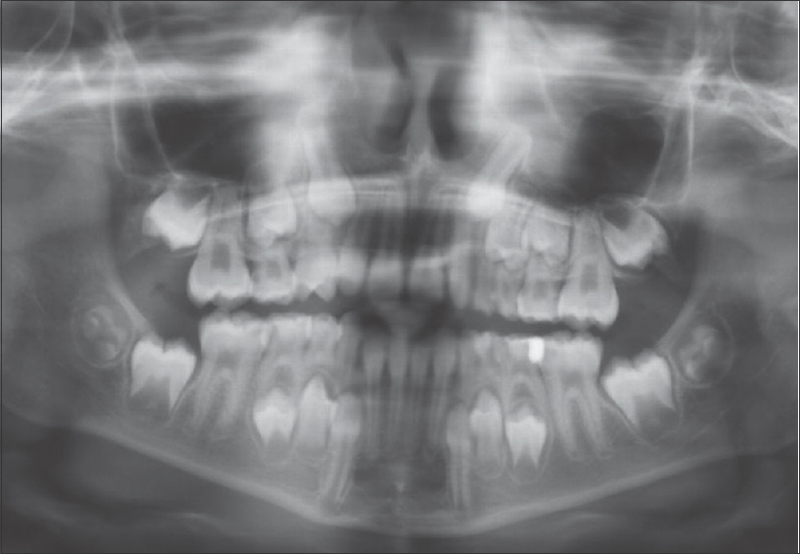 Boyd R. Clinical assessment of injuries in orthodontic movement of impacted teeth: I. Methods of attachment. Am J Orthod1982;82:478-86. Canoglu E, Akcan CA, Baharoglu E, Gungor HC, Cehreli ZC. 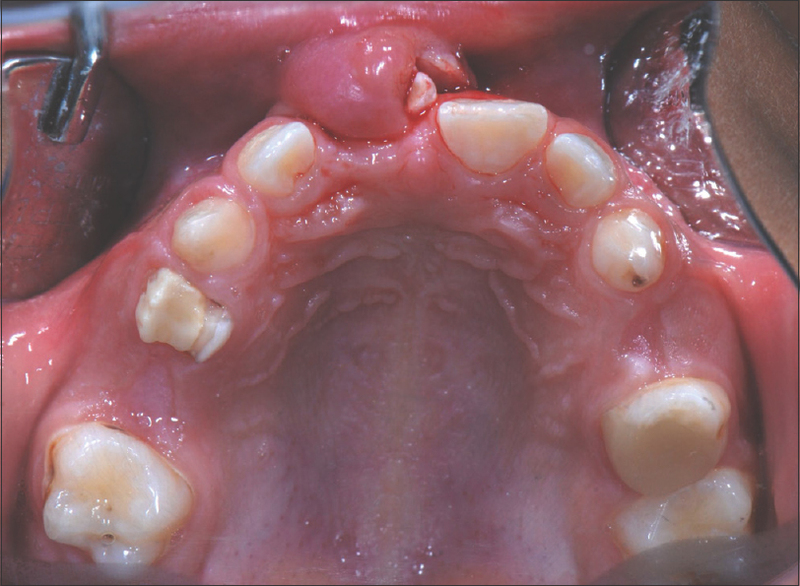 Unusual ectopic eruption of a permanent central incisor following an intrusion injury to the primary tooth. J Can Dent Assoc 2008;74:723-6. Kuvvetli SS, Seymen F, Gencay K. Management of an unerupted dilacerated maxillary central incisor: A case report. Dent Traumatol 2007;23:257-61. Gugnani N, Pandit I, Gupta M, Gugnani S, Vishnoi A, Sabharwal O, et al. Ectopic eruption of maxillary central incisor through abnormally thickened labial frenum: An unusual presentation. J Indian Soc Pedod Prev Dent 2017;35:94-7. 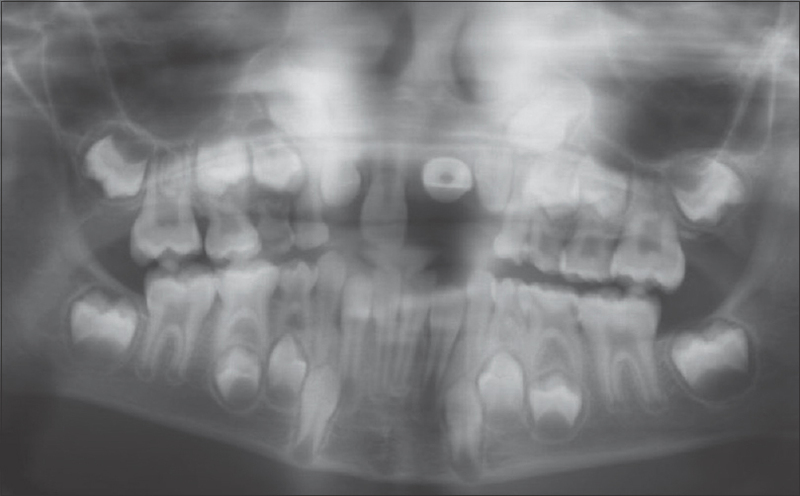 Macías E, de Carlos F, Cobo J. Posttraumatic impaction of both maxillary central incisors. Am J Orthod Dentofacial Orthop 2003;124:331-8. Kumar G, Rehman F, Chaturvedy V. Soft tissue applications of Er, Cr: YSGG laser in pediatric dentistry. Int J Clin Pediatr Dent 2017;10:188-92. Martens L. Laser physics and a review of laser applications in dentistry for children. Eur Arch Paediatr Dent 2011;12:61-8. Tanboga I, Eren F, Altinok B, Peker S, Ertugral F. The effect of low level laser therapy on pain during dental tooth-cavity preparation in children. Eur Arch Paediatr Dent2011;12:93-6. Olivi G, Genovese M, Caprioglio C. Evidence-based dentistry on laser paediatric dentistry: Review and outlook. Eur J Paediatr Dent 2009;10:29-40.